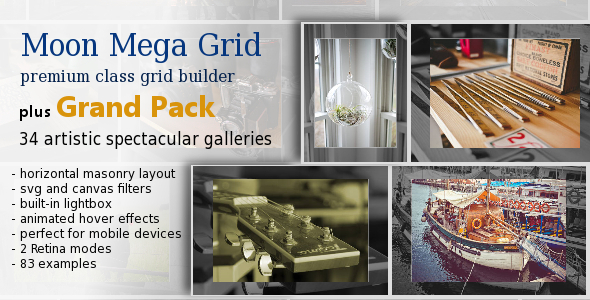 Moon Mega Grid plus Grand Pack Created by alquimisto. This templates have specific characteristics, namely: Create your unique artistic spectacular gallery for your photos with variety of beautiful animated hover effects, using templates and examples, color schemes, svg and canvas photo filters and other . Usually there are two ways for arranging ‘hover’ effect on mobile devices: you can ignore it (first) or you can use buttons (second). I suggest the third way: simulation of a ‘hover’ effect after the first touching an icon. After the second touching a ‘click’ event is simulated. This approach is fully realized in the Grand Pack. Of course, You can abandon this approach by simplifying of an appropriate template. It is obvious, that the grid opened on mobile devices will differ from the grid opened on the PC. So Moon Mega Grid gives the possibility to make different templates for PC and for mobile devices. Due to memory optimization Moon Mega Grid gives the possibility to show up to several thousand items on one page. Even if you have thousand items on your device, crash is hardly to happen if you rotated the screen and the view was rebuilt. The width and the height of the item will be a half of the native sizes, regardless whether the device has got Retina screen or not. If your device doesn’t have Retina screen the src will stay unchanged. But if it is a Retina device, the src attribute will be changed and ’@2x’ suffix will be inserted before the file extension. Of course, you can switch off Retina mode at all. Usually grids eat resources. There are a lot of DOM elements. Thera are heavy images. All information is not stored in DOM-structure but in the special object. All items which are not on the screen at the moment are removed from the DOM. Because of that you can place up to several thousands images on one page even while using devices with Retina screen and photo filters. It is an unprecedented set of wonderful templates with original animated captions. Every template has been tested on various mobile devices and simulates the ‘hover’ effect for them. Many templates give possibility to choose a color schema. All SVG-filters are supported. They will add artistry to your page. Moon Mega Grid has its own small library for canvas filtering. The list of supported canvas filters: grayscale, sepia, colorize, contrast, saturate, vibrance, noise, brightness. You can use combination of canvas filters. In most circumstances SVG-filters are preferable because they are faster. From the other side, canvas filters works well on old versions of Android. IE8, IE9 support them too. You can set Moon Mega Grid to use SVG-filters in browsers which support SVG-filters. Otherwise the browser will use canvas filters. There is another possibility for IE8, IE9: you can use native MS-filters. You can create your own templates or modify templates from Grand Pack. Template object includes a markup string and a callback function. It can include additional objects of templates for mobile devices, IE9 and IE8, IE8. The template tool is based on the Underscore.js template function. Custom templates can be stored in separate files. Initially the whole script was written on CoffeeScript that guarantees a high level of code quality. Source files include CoffeeScript files, structured by classes, as well as less files and css files. Every template of the Grand Pack has its own folder. Moon Mega Grid v2.2: Bug fixed. New example.